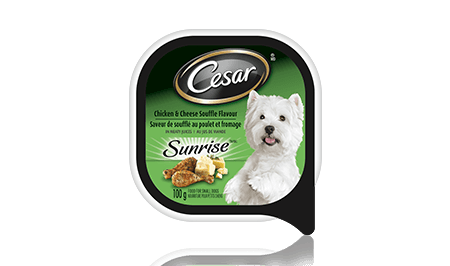 CESAR® SunriseTM breakfast chicken & cheddar cheese soufflé is a dish created for the comfort-food lover in your companion. Feed 3 trays daily per 4.5 kg (10 lb) adult dog. CESAR® SunriseTM Chicken & Cheese Souffle Flavour in Meaty Juices is formulated to meet the nutritional levels established by the AAFCO Dog Food Nutrient Profiles for maintenance.